MAESTRO 2 separates small amount and prototype series of PCBs fast and economically. The compact and stable aluminum frame requires only a minimum of space. The PCB is held with both hands and fed between the circular blades for separation. The clearance between the upper guide and the lower guide is adjustable to ensure that the PCB is only fed through the machine in the pre-scored groove. MAESTRO 2 separates small amount and prototype series of PCBs fast and economically. The compact and stable aluminum frame requires only a minimum of space. Is the reasonable model to start with, suitable for smaller numbers of PCBs. 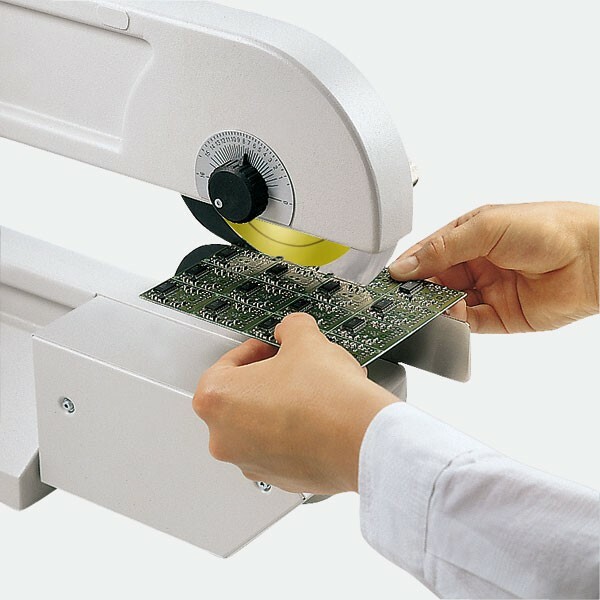 The PCB is fed manually between the circular blades and is thereby separated.